I ask this because in my area in the summer there is a lot of these . And I got poked fun of at work because of my Ryker purchase. I told the guys at work I am not a biker and this is not a bike but they can't seem to understand that. I would have no issue attending a bike nite. Doesn't matter what you drive or ride, there is always someone who can't seem to get over it. I ride all makes of bikes including a HD - I don't care what people think - I'm out to enjoy the ride. ... 1) Or keep going bye because the "Real" Bikers will look down on your 3 wheeled "bike". 2) I told the guys at work I am not a biker and this is not a bike but they can't seem to understand that. With all due respect, why are buying into the stereotype that a "biker" is one that rides on 2 wheels only. I wouldn't avoid going to the local bike night on my Spyder, which is a bike, just like I wouldn't hesitate going on either of my 2 wheelers. If you don't respect yourself enough to call yourself a "biker", why should anyone else. I'd stop in to bike night. If I didn't feel welcome I'd leave. No big deal. I have a spyder not a ryker but it really doesn't mater. I have been to a number of bike nights, bike runs, bike bars and never has anyone said I should not be there. The only time someone said directly to me that my spyder was not a bike was in a Walmart parking lot and it was the cart guy. do real bikers ride harley's or push them? But it is not a bike.....it is indeed a trike. It is however you look at it a motorcycle! Again, with all due respect, the terms bike, motorcycle, trike 3 wheeled motorcycle, etc are interchangeable. A motorcycle, often called a bike, motorbike, or cycle, is a two- or three-wheeled motor vehicle. Motorcycle design varies greatly to suit a range of different purposes: long distance travel, commuting, cruising, sport including racing, and off-road riding. A motorized tricycle, motor trike, or three-wheeled motorcycle is a three-wheeled vehicle based on the same technology as a bicycle or motorcycle, and powered by an electric motor, motorcycle, scooter or car engine. Vanderhall Motor Works... When most of us think of three-wheeled vehicles, the conventional trike comes to mind. Commonly referred to as a delta design, it is basically a motorcycle with two rear wheels, and one front wheel. Along came the reverse-trike, sometimes referred to as a tadpole configuration which also appeared quite early in the development of motorcycles. So as not to hijack this thread... keep an own mind, accept versatility, ride your "ride" and enjoy life. I Consider myself a biker having ridden HD for years. I also consider the Spyder a Bike or as some would say a REVERSE Trike. Bottomline, it's all in ones mind set. I have never ridden a bike to a bar; because I would have to ride it home after. 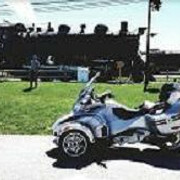 I have ridden to restaurants with other riders including some on Spyders and intend to ride my Rally to both of my BMW riders clubs. I rode to one of them already and the other members were really excited about the Rally. Considering I ride further to that meeting than anybody else what could they say? It all depends on the situation and your personal comfort level. I rode with a group for over 10 years that welcomed any bikes. They did a group ride and then stopped off at a restaurant. In the "glory" days...there would be 50 assorted bikes. From HD's to Spyders (thanks to me and the spouse). Driving down the road...and pulling into a parking lot at a bar or restaurant...is another thing. That can go good or bad. We did a "by accident" thing about 10 years ago. The spouse and I were on a ride, and wanted to stop at one of our favorite restaurants/watering holes. There were about 10 HD's parked out front. No problem...we parked by them and went in. OOOoooooooooooopps. That bunch was a contingent of the "Hells Angels" and they were dressed up in all their glory and colors. They were in the bar part...we always used the restaurant part. We had our riding vests on that day (some would say "colors"). They gave us a good once over, and we acknowledged them. They left before we did and a couple of them gave the Spyders a good once over look. No harm, no foul. We did feel a little better once they were gone though. As I said...its all about comfort level. We don't ride with a group any longer. It got dis-organized and political. We still stop off where we want, bikes or not in the parking lot. We interact if invited...but otherwise, keep to ourselves. Last edited by ARtraveler; 02-12-2019 at 03:05 PM. IMG_3899.jpgIMG_5394.jpghonestly there's this 1 local bar I would not. I know what I have & how I enjoy it. Part of that is don't let ignorance to interfere with my enjoyment. Bike nights sure I'll stop, bike night & alcohol not so much. I've been riding for 50 years. Never have been and never will be a BIKER. I am a motorcyclist and I ride what I want, when I want, and where I want. Anyone doesn't like me or my machine that's their problem not mine. Life is short and mine is getting shorter, I don't aim to please. Our local riding club, which we are members / officers, has many Spyder owners in addition to Harley, Honda, Victory, Indian and Ducati. Variety is a good thing and we have a great time together. Many miles a year. I will say the number of Spyders in the club has risen from a scant few years back to about half the club now. Actually outnumber the Harleys on many rides these days. Forum Can Am Ryker Bike Night.